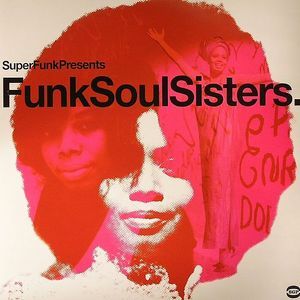 VARIOUS Funk Soul Sisters vinyl at Juno Records. 1. Lynn Varnado - "Tell Me What's Wrong"
2. Loletta Holloway - "Only A Fool"
3. Bonnie & Sheila - "You Keep Me Hanging On"
4. Paula Lamont - "One Monkey Can't Stop The Show"
5. Valorie Keys - "Listen Here"
1. Louise McCord - "Better Get A Move On"
2. Betty Bibbs - "Pounds Of Soul"
3. Delilah More - "Ooh Wee Baby"
4. Vera Hamilton - "Heavy Heavy Hangs My Heart"
5. The Genies - "Know What To Do When You Get It"
1. Spanky Wilson - "Sunshine Of Your Love"
2. Lynn Varnado - "Staying At Home Like A Woman"
4. Fontella Bass - "Hold On This Time"
1. Jeanette Jones - "I'm Glad I Got Over You"
2. Mille Jackson - "My Heart Took A Licking (But Kept On Ticking)"
3. Thelma Jones - "Mr Fix It"
4. Rene Bailey - "It's Too Late For Tears"
5. Little Anne - "One Way Street"